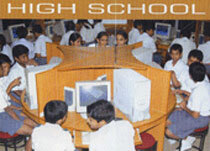 The school has a state of the art Computer center with L.C.D. Projector, C.D. Writer etc. 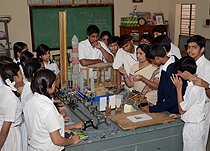 Keeping pace with the changing times, IT education is given priority and both teachers and students are exposed to computer education. 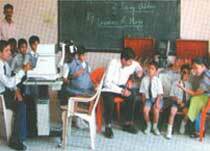 All teaching staff members are trained to conduct classes through computers. 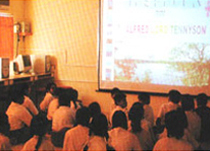 The school is well equipped with a variety of audio visual aids to make the teaching – learning process interactive and interesting. The Audio Visual room is equipped with OHP, TV & Video and Cassettes on a wide range of topics. A wide variety of hygienically prepared hot and nutritious food is available at a reasonable price. The school library is well equipped with a variety of audio visual aids to make the teaching – learning process interactive and interesting. The Audio Visual room is equipped with OHP, TV & Video and Cassettes on a wide range of topics. 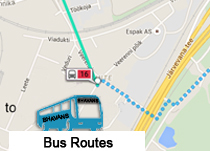 Local as well as outstation excursions are arranged annually for all classes for pleasure and educational purposes. 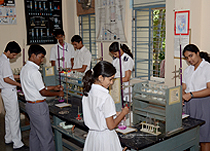 The School has well equipped Maths, Physics, Chemistry, Biology and Computer labs. The computer lab is equipped with a multimedia system and a variety of CDs. 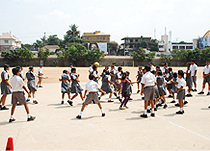 Games, Sports, Trekking, Skating etc. 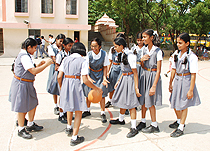 are a part of co-curricular activities. 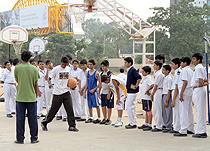 The school has a vast ground and facilities for cricket, football, basketball, volleyball and table tennis etc. Matches are held throughout the year between the six houses that compete keenly in track and field events as well. March past and display drills are part of the ceremonial parades held on national festivals. The school has a sick bay, managed by a medical assistant. Senior doctors are available on call. 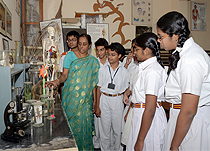 From time to time medical, eye and dental camps are organized by the school. An experienced doctor visits the hostel twice every week and more often when necessary. A child taken ill seriously will be sent to a recognized hospital for immediate treatment and admission, if necessary. The parents are informed as early as possible and are billed for the treatment given. Students are expected to enroll themselves as members of the Health Insurance Scheme. 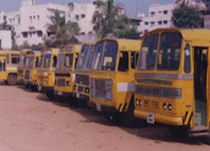 The school has transport facility for both staff and students.